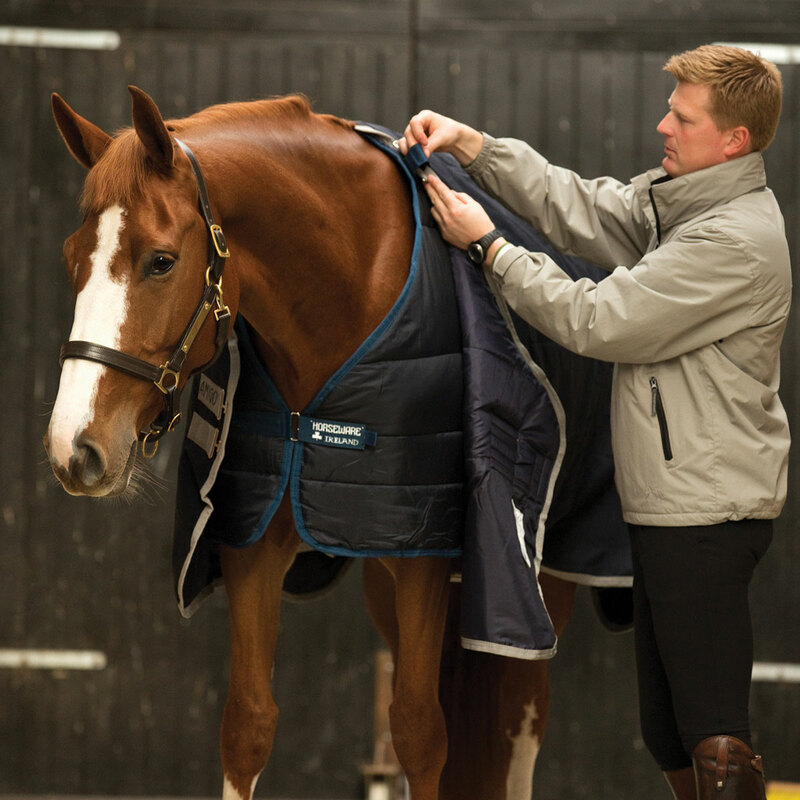 Dressing your horse for any weather has never been easier with the Horseware Interchangeable Liner system. These liners are breathable and have thermobonded fiberfill for long-lasting heat retention to keep your horse cozy and comfortable. It utilizes an exceptional fit along with Velcro® and snap closures to allow you to attach the liner to the outer shell without cumbersome extra straps. 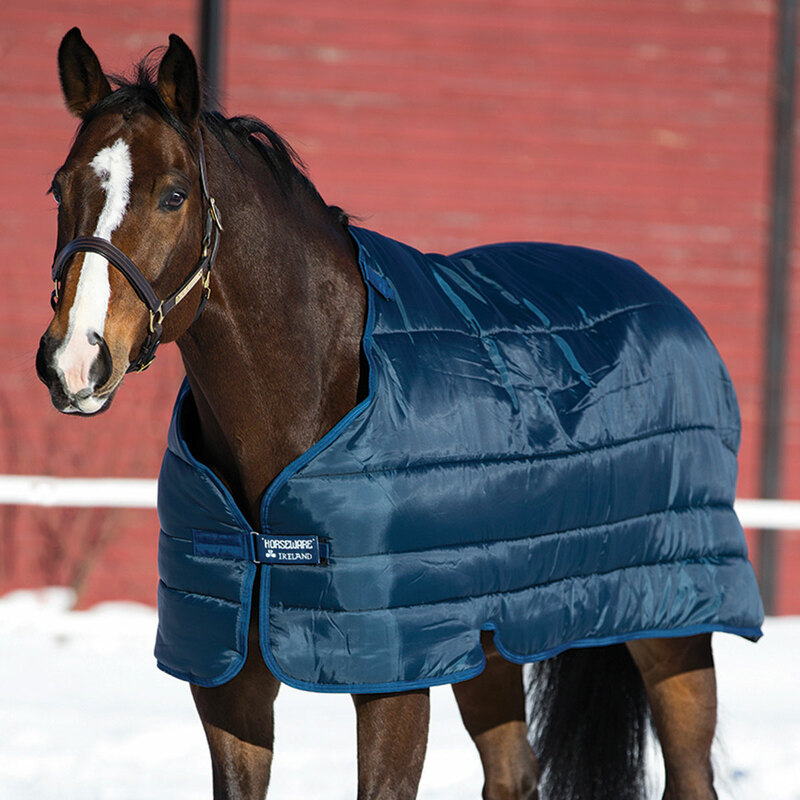 Simply mix and match the liners with select Rambo®, Rhino®, and Amigo® blankets to have up to five blankets in one so your horse is ready for any weather. Available in Light (100 g), Medium (200 g), and Heavy (300 g). Horseware® Interchangeable Liner is rated 4.7 out of 5 by 27. Rated 5 out of 5 by SP Customer from Versatile, Easy To Use These are super warm - I'm using a 200g liner on a hard keeper young OTTB under a medium-weight SmartPak blanket. Fit true to size (using 81" liner under 81" blanket). Never used liners before, but tried based on a friend's recommendation. Stays in place perfectly with just the chest strap & leg clips, I'm not using the wither velcro since it doesn't easily attach to a non-Horseware blanket. Horse is young & active, lots of rolling & playing, liner has not shifted at all. I probably would have been fine with the 100g liner in NC, this horse is pretty warm-natured, but I wanted to make sure I could keep him warm even if clipped. I've also used liner under a generic brand sheet while letting other blanket dry out. 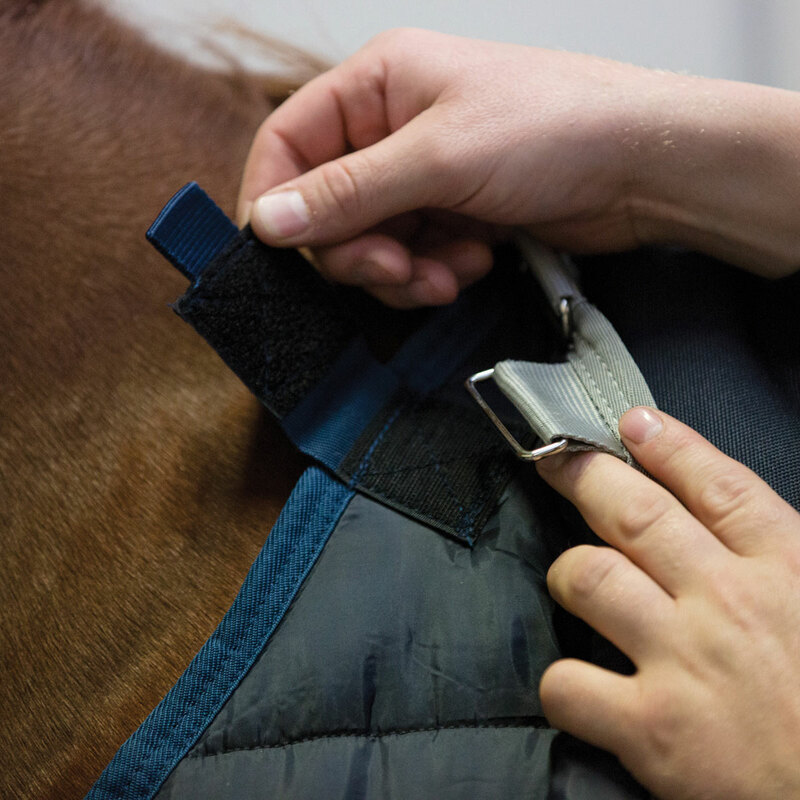 So glad I tried this great tool which helps save money on expensive horse clothes! Rated 5 out of 5 by Dida from Perfect. I bought this liner quickly last year after my horse shredded his 100g Amigo the day after I clipped him. I didn't have the money to buy a $130 new turnout, so instead paired it with my smartpak ultimate turnout sheet that I had bought him super recently and hoped for the best. It worked perfectly! Definitely don't recommend doing if your horse's blankets tend to shift, but there is enough stability in the liner under the turnout, and the hind clips can clip onto the leg strap Ds of his turnout sheet! He wore this combination nearly every day till at least mid-March and was always toasty warm and zero shifting and he plays rough! Plus I put it with his heavy duty Rambo turnout blanket when we had a nasty winter snow storm and he was snug as a bug in a rug! Rated 5 out of 5 by dlb1031 from Great price for a great liner Not sure how he did it but my daughter’s horse managed to tear a huge hole in his liner. I cringed thinking of how much a new one was going to cost. I am so glad Smartpak carried it because I was able to use a coupon & get free shipping. I’m so glad smartpak carries the brands I need. The liner is great & comes in different weights. Unfortunately not completely horse proof but I like how it clips to the outer shell. Rated 5 out of 5 by parider89 from Great Liner I bought this for my OTTB because he’s clipped and we live in PA. I got him the 100 gram to go under his 400 gram Rhino Plus. It’s a very nice liner, does not rub him or create more static. I have this for my retired QH as well so we can layer him up as needed. Rated 5 out of 5 by Liz R from Soft and warm I bought this as a replacement for the old liner which had an unfortunate accident due to user error but no fault of the design or blanket. I've been really happy with the liner and these blankets. Rated 5 out of 5 by Kaycee from Bought this end of season last year. Thought it would give me more options turning my Amigo sheet into a mid weight blanket and my original middle weight Rambo into a heavy weight blanket. So far working great even though the Rambo doesn't have the metal loops at shoulder to run the Velcro fasteners to it stays in place. Rated 4 out of 5 by MyMoPony from Great solution for added warmth I bought this for added warmth under ny horse’s high necked Rhino turnout sheet and medium blanket. It works perfectly, even though it’s not actually designed for use with high necked models, just clipped into the tailcord dee rings. My horse tends to run between 75 and 78 in horseware clothing. His Rambo flysheet is a 75, but his Rhino wear is all 78. I found that the 75 in this liner fits well around his withers and shoulders, but is a little short-doesn’t quite reach his tail. I would probably go up a size next time. Rated 4 out of 5 by Stephanie from Works great My baby boy likes to be toasty, even in our relatively mild Northern California climate, so this liner really helps me diversify his (and his mother's) wardrobe a bit for different temperatures. It stays remarkably stable which is great as well.